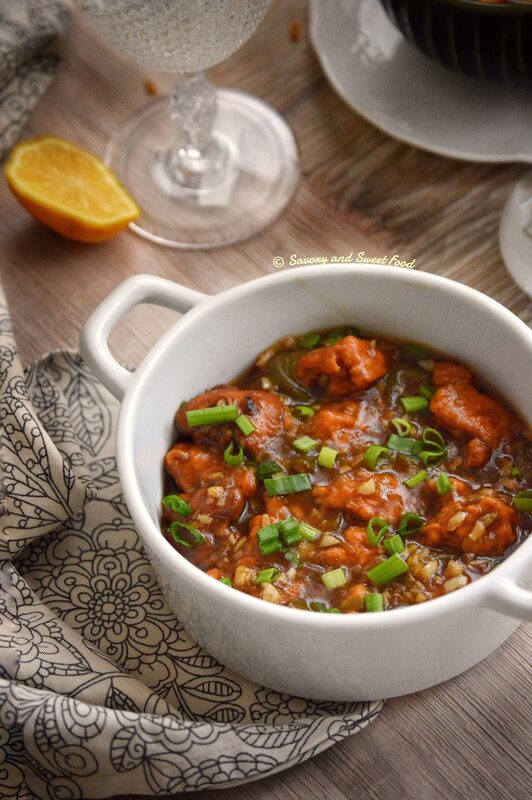 A popular Indo-Chinese dish – Chicken Manchurian. Deep fried succulent pieces of chicken tossed in a spicy and saucy gravy. 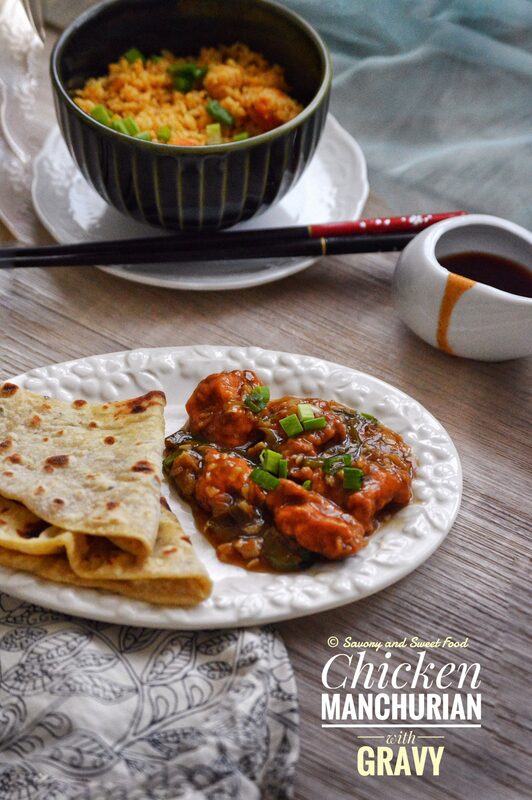 Chicken Manchurian is my all time favorite. I used to love this dish since I was a child. 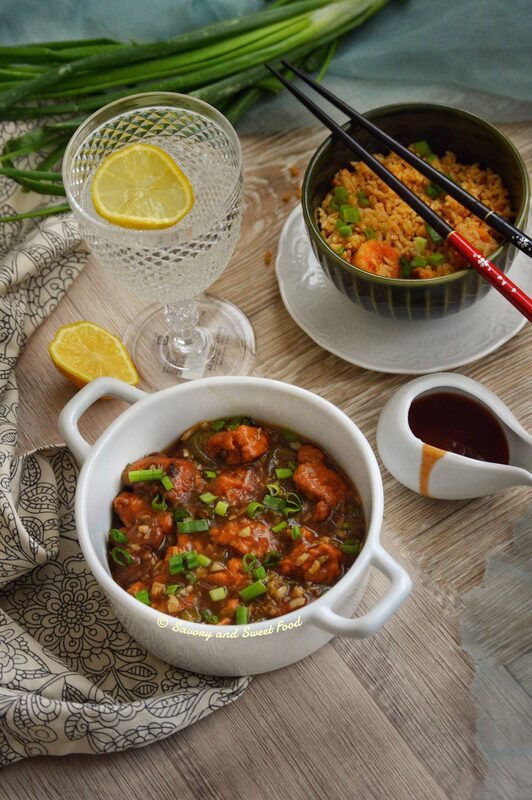 Chicken Manchurian and Fried Rice is the ultimate combo. But this tastes great with noodles and plain boiled rice too. 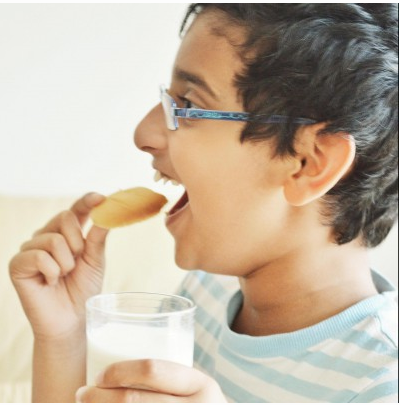 I have it with chapathi also. This dish is quintessentially spicy and full of garlic flavor. This dish is served across the world more in Indian restaurants than in Chinese restaurants. 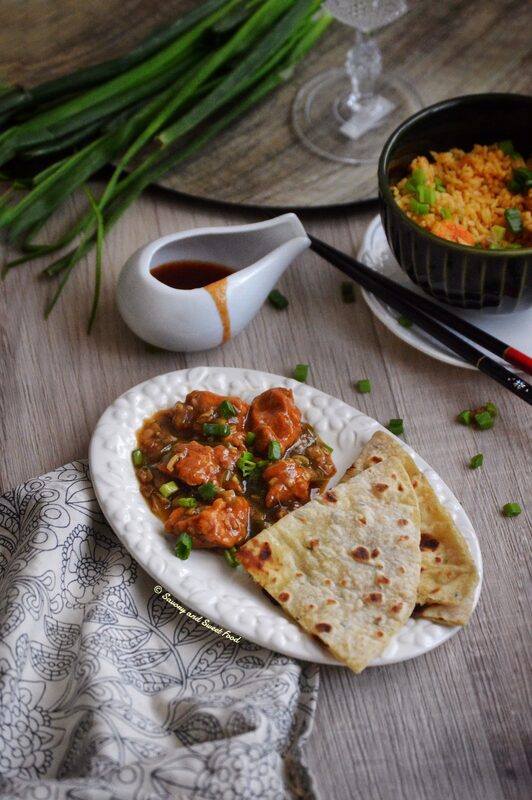 This dish was originally a Chinese dish but our Indian chefs modified it by making it more spicy and adding Indian masalas to best suit the Indian tastebuds and oh, boy, it tastes so yum!! There are many variations of this dish, and I love almost all them, except for those which has tons of cornflour making the gravy a thick blob. That I really don’t like. So be very careful while adding cornflour to the gravy, too much of it will spoil your dish. 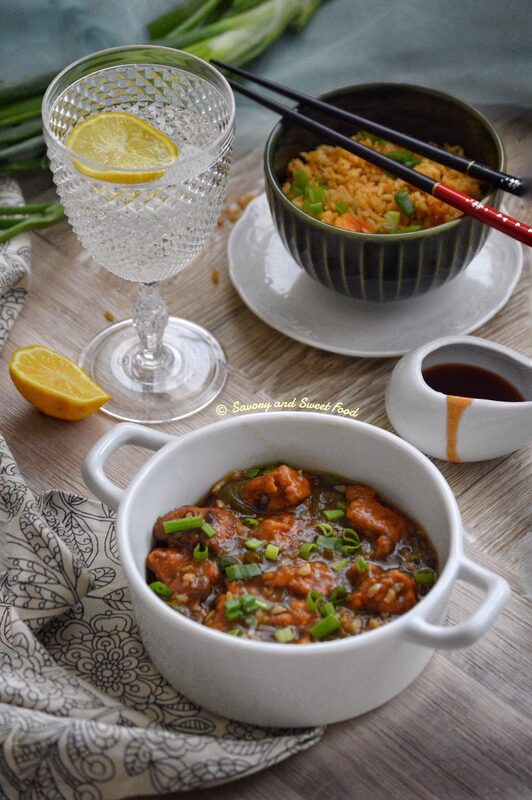 Try out this scrumptious Chicken Manchurian with this Spicy Chicken Fried Rice and feel completely mesmerized. If you want to have that dark color to your gravy, you have to use dark soya sauce. Boneless chicken works best for this. You can use maggi noodles tastemaker for this gravy instead of the maggi cube. Just mix it in 1 1/2 cups of water. Adjust the number of green chillies added according to your preference. 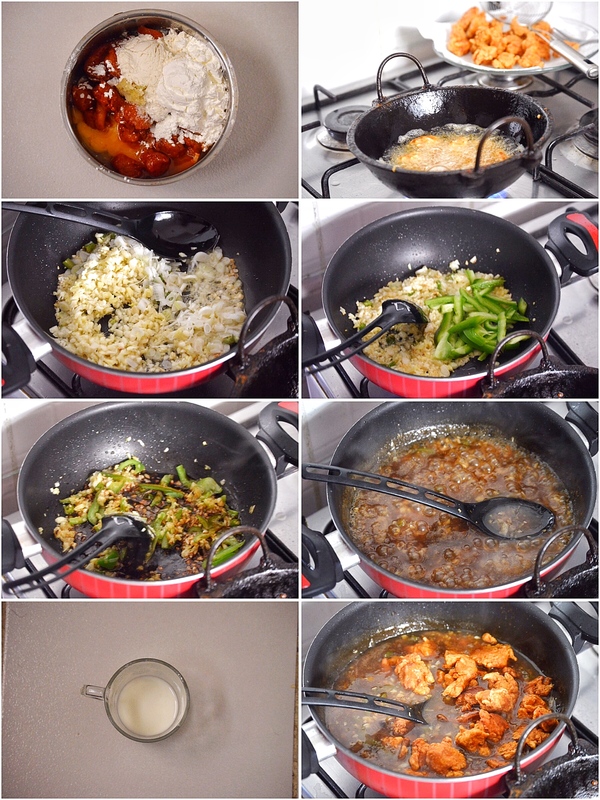 Marinate the cut chicken pieces with the above mentioned ingredients. Keep for 30 minutes. Deep fry till golden brown in color and till the chicken is completely cooked. This will take only 10 minutes of deep frying, 5 minutes per side. Do not overcook, or the the chicken will turn hard. Heat oil in a saucepan. Sauté the ginger, garlic, green chillies and spring onion whites for 2-3 minutes. It doesn’t have to get browned. Add capsicum and sauté for 2 minutes. Add the soya sauce and green chilli sauce. Mix around for a minute. Pour in the chicken stock and vinegar. Ad a big pinch of sugar. Check for salt and add if needed as the maggi chicken stock and soya sauce will already have salt in it. Let this come to a boil. Add cornflour mix to the gravy, a tsp at a time. Keep on adding till you get the desired consistency and thickness to the sauce. Boil for a minute. Add in the fried chicken and mix. Cover the pan with the lid and let it simmer for 2 minutes. Add 1/2 tsp of pepper powder. Remove from heat and garnish with spring onions greens. 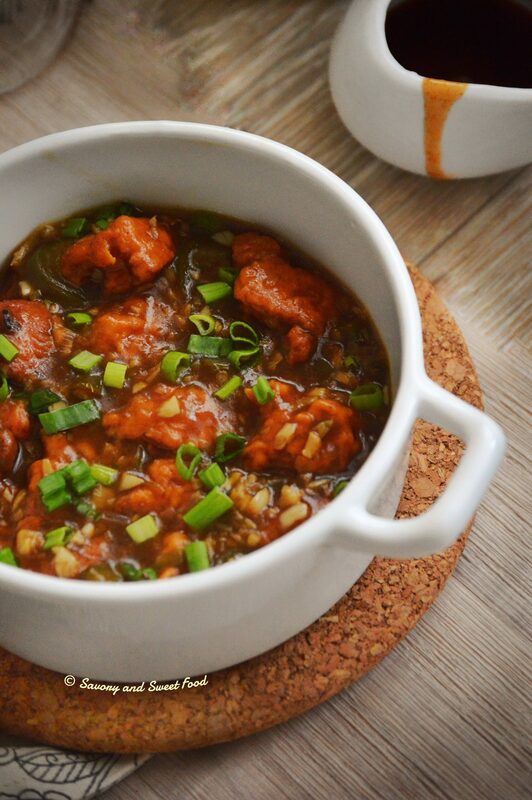 A popular Indo-Chinese dish-Chicken Manchurian. Deep fried succulent pieces of chicken tossed in a spicy and saucy gravy. Soo glad! 🙂 Thank you. You can get tender chicken by marinating it overnight. And other tip is that do not fry the chicken for long, just6-7 minutes of cooking would be enough.